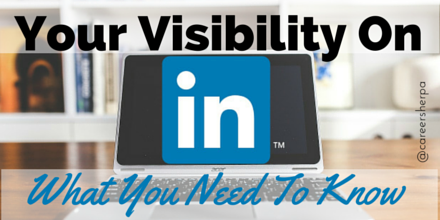 Did you know that changes to LinkedIn could be impacting your visibility? No matter why you use LinkedIn- for job search, to promote your business or just to stay connected, you should know how people find you and learn how to improve your profile and status updates for increased visibility. Overall, most people are not using LinkedIn regularly. If you hope to get noticed or stay on someone’s radar, you’ll have to be active in groups, publish long-posts and post status updates. 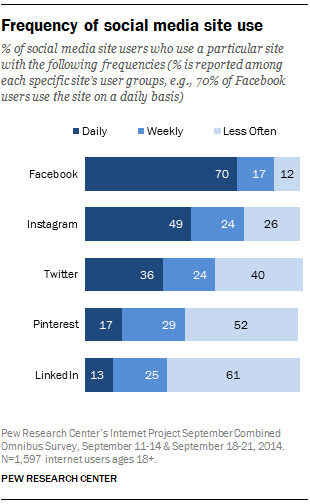 Pew Research found (image below), found that only 13% of LinkedIn users interact with the site daily. Are Your Status Updates Getting Seen? Fewer people are seeing my updates and this is probably happening to you too. I’ve been watching the stats on who visits my site from LinkedIn, and I’m not liking what I’m seeing. As you can see from the graph below, there has been a steady decline in referrals from LinkedIn to my blog. I haven’t made any other changes to how or what I am sharing on LinkedIn, so that isn’t a factor. How Do You Know Who’s Looking At Your Status Updates? UPDATE: You can no longer see the views, shares and comment stats from each of your status updates. What you can see is either a list of all your activity or sometimes (not sure why only sometimes), the number of people who liked a recent post. As you can see here, all I’m seeing is how many people viewed my profile and where my profile ranks. Quick Tip: You can increase the number of views by sharing your update in groups. Ideally, choose to post in professional groups related to your desired occupation. Sharing content within groups creates an awareness of you and helps develop a brand. Always think about what you want to be known for and share that type of content, either that you’ve written or someone else’s work. LinkedIn has made changes to the order or priority of your home feed. Without telling us, LinkedIn decided to change how they prioritize your home feed. (By the way, Facebook made this change to your home feed awhile ago.) By default, you will see the “Top” status updates. This means, you will see the updates with the most likes, shares or comments before you see other updates. I don’t know about you, but I want fresh news. And if someone I know shares something, but no one likes it, I’m not likely to see it. So here’s what I have to do each time I log into my LinkedIn account to ensure I see what my network is talking about at that moment! There are three dots (very easy to overlook) immediately under the status update section. Choose “Recent Updates” to see real-time updates. You will have to do this each time you log into LinkedIn if you want to see recent updates. This shows that 608 people have viewed my profile within the last 90 days. But I want to know more…don’t you? UPDATE: Sometime after April, 2015, LinkedIn changed the analytics. You still have access to valuable data, if you use it! Here is what you data will look like today. Now you can see a summary of the actions you took each week. In early April, profile views spiked, so it is worth taking a look at what I did that week on LinkedIn to see if there is any correlation. My actions were down, but my profile views sky rocketed. I can’t explain this, other than perhaps my profile was shared somewhere or I was mentioned somewhere else. You should monitor your views and see if you notice a correlation between your activity and views. The general assumption is, the more actions you take on LinkedIn, the more views your profile will receive. 6/18/2015 UPDATE: This data is no longer provided! But you can see titles, industry and geographic location still. The next invisible tab to the right, shows the keywords people used to find me (pink circle) and where the viewers came from (purple circle). When you move your mouse over the circles, you can see more data. This keyword data helps you see if the wording in your profile is effective in attracting people. The number of views for keywords should be higher for your summary or job description. Quick Tip: Review your profile and make sure you have a comprehensive summary and full description under each job which should increase the likelihood your profile will get found. Here’s a 20 point checklist to improve your profile. The purple circle shows where people found my profile. The majority of people found my profile because of something I posted (a status update) and showed up on their homepage. Quick Tip: By posting status updates, you have a huge opportunity to increase the number of people who view your profile. It is almost like you are listing a new house…everyone wants to see inside! Here are 10 status updates to get you more visibility. The next invisible tab to the right shows information about who the viewers are by their job titles and industries. Quick Tip: As a job seeker, you might see more “Human Resources” and “Recruiter” job titles or at least want to see those titles. You will also want to see the titles of Hiring Managers who may be scoping you out. The industry circle helps you see if you are attracting views from the correct industry. This may also help you increase the types of companies you look for opportunities within. The next set of data is tells you about the people who have viewed your profile- where people live and work! The green circle is pretty valuable in understanding who is viewing my profile because I don’t have the paid version to see the names of people. There are numerous views from UofR (and related branches) because I do some work there. These views are likely from people I meet with. Quick Tip: The company stats could help you determine if your application has been received or that an interviewer is checking you out. I am not a paying member of LinkedIn, so I can’t see the names of people who viewed my profile. Arnie Fertig, a colleague, was kind enough to show me his results as a paid subscriber. For every circle of data, Arnie can see the profile information of people who viewed his profile. As a job seeker, paying for this is only worth while, in my opinion, if you are going to actually do something as a result of having access to the information. In other words, if you see someone has viewed your profile and you are curious, then you should In-mail them a message. One thing is for sure…we’ll continue to see changes across all social networks. It helps to keep your toe in the water so you know what’s happening.